When your pet is feeling under the weather, sometimes rest just doesn't do the trick. Cephalexin for dogs and cats is a safe and effective antibiotic used to combat a wide range of bacterial infections from dermal to urinary. It is also quite effective against common bone and joint infections. 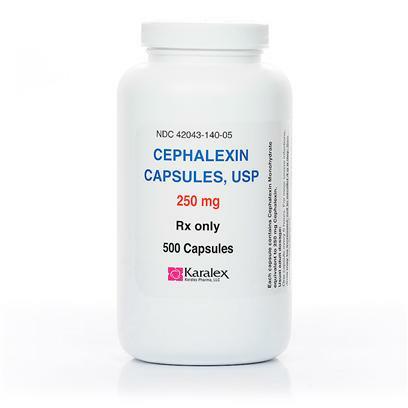 Cephalexin is especially useful for staphylococcal or deep skin infections. While Cephalexin for dogs and cats is often prescribed to combat common bacteria found in cats and dogs, it can also be used to fight off infections in humans. Cephalexin for dogs and cats is the generic alternative to Keflex. Side effects of Cephalexin for dogs and cats rarely occur, but may include loss of appetite, vomiting, diarrhea, drooling, rapid breathing, excitability and fever in cats. Animals with allergies to penicillin or cephalosporins should not use this drug, and may exhibit itching, rash, difficulty breathing, or more serious symptoms if they do so. Use Cephalexin with caution in pregnant and nursing animals. Use as directed by a veterinarian. In typical cases, dosage is 10-15 mg/lb, administered orally twice a day for both cats and dogs. Cephalexin can be taken with or without food and be sure to complete the full course of treatment in order to prevent relapse. Do not use Cephalexin for dogs and cats to treat fungal or viral infections, or those caused by parasites and mites.